Geography/Culture: Belief: Taoist. As a mortal She was said to have lived within circa 684-705 CE. Origin: China. Description: Virgin of agility, immortality and mother reverence; Spirit of the Mother-of-Pearl Mountain; She Who floats from peak to peak on a many-colored cloud; Matron of the house; She Who says "Beauty can only be recognised by those who have beauty in their inmost self". 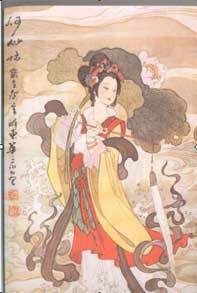 She is one of the Eight Immortals (Pa-Hsien). The term Pa-Hsien is figuratively used for happiness. The number 8 has become lucky is association with this tradition. To whom is sacred: wild fruit (which She collected on the mountain); huge, long, magic lotus-blossom (the lotus is the flower of open-heartedness); peach of immortality; sheng (reed-organ); wine; the number 6 (at birth 6 hairs were found growing on Her head and it is said She never had any more); the stone Yn-mu shih, `mother-of-pearl' (by the eating of which She attained immortality); cloud of many-colours. Icon: Extremely beautiful, elegantly dressed, She holds either the lotus-flower (sometimes it is worn on Her shoulder) or the peach of immortality. She may play the shˆng or drink wine. She is shown with a full head of hair. Male associate: besides the other five males of The Eight Immortals, She is especially associated with L-Tung-Pin, Her teacher, who is said to have converted Her. Perhaps a popular aspect of Hsi-Wang-Mu, keeper of the peaches of immortality. Of the other seven Immortals, only Lan-Ts'ai-Ho, see below, is female, when not portrayed as an Immortal Shehe. Sources: Blofeld TRI 98; Couchoud AM 347, 349 & image; Funk & Wagnall SDFML 500; Lehner SSS 15 image 37 fig 107; Monaghan BGH 142; Werner DCM 158, 347-8. Geography/Culture: Belief: Taoist. Perhaps older than 960-1280 CE. As a mortal eris life is assigned to the Tang dynasty. Origin: China. Description: Divine ragged SheHe of music, singing, joy and delight; Protector of street muscians, lunatics and the indigent; SheHe Whose songs are of the delusive pleasures of life; Shehe Who personifies extreme Yin, personal and cosmic; Supporter of gardeners and the flowers they grow; Spirit of dichotomy and the unconventional; Shehe Who wears padded clothes in summer and in winter, wearing cotton, sleeps on snow; Shehe Who knows the secret of perpetual renewal; Scorner of money; [Matron of transvestites]. One of the Pa-Hsien, The Eight Immortals. Shehe is sometimes portrayed as wholely female which would seem appropriate for a personification of extreme Yin. To Whom are sacred: ling-chih fungus; stork, some say crane, (on the wings of which, say some, the mortal SheHe was lifted to heaven); deer; basket of (some say) fruit, (some say) flowers; flute; castanets; wine (on the fumes of which, say some, the mortal Shehe rose to heaven). Icon: a pink and white complexioned adolescent with hair in side-buns, wearing a tattered blue gown bound by a black wooden belt three inches wide, one foot bare, the other shod. Shehe carries a flute, or a pair of cymbals. Male associates: as well as the six male Immortals, the Son of the Dragon- King-of-the-Eastern-Sea, who attempted to steal Eris flute and to imprison Erim when the Pa-Hsien were crossing the sea. Shehe is also concieved as a man ("Who could not understand how to be a man"), with the name Ch'ih-Chiao-Ta-Hsien, the-red-footed-great-genie. As personification of extreme Yin, Shehe is perhaps, (like Ho-Hsien-Ku), also an aspect of Hsi-Wang-Mu . Eris personal name is said to have been Yang-Su. Sources: Blofeld TRI 97-8; Couchoud 348 & image; Lehner SSS 15 image 37 fig 108; Monaghan BGH 174; Larousse NLEM 393; Werner 341, 345-6.
worked on: August 6, 1991; April 24, 1992; August 15, 1994. Revised May 21, 1996.